Extending a full 6 feet, this telescopic gutter brush lets you reach and clean gutters with both feet safely on the ground. Helping you easily clean gutters to prevent clogs and potential water damage, the telescopic brush helps keep your home safe ... keeping you safely off the ladder! 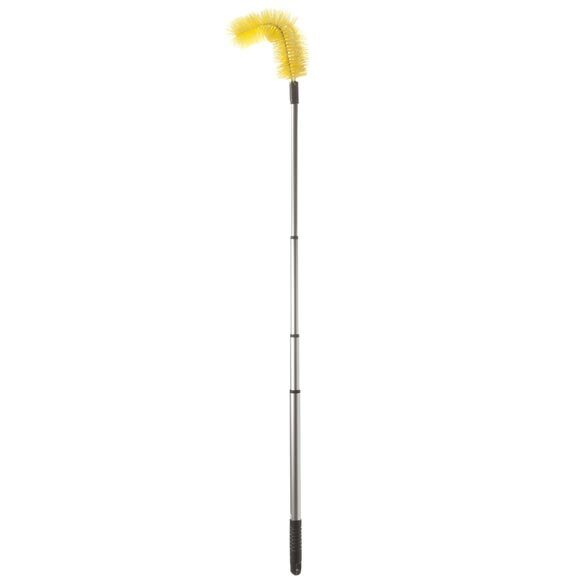 Sturdy aluminum pole extends from 38"L to 74"L.
Flexible-head brush angles in to efficiently remove leaves, twigs and debris. 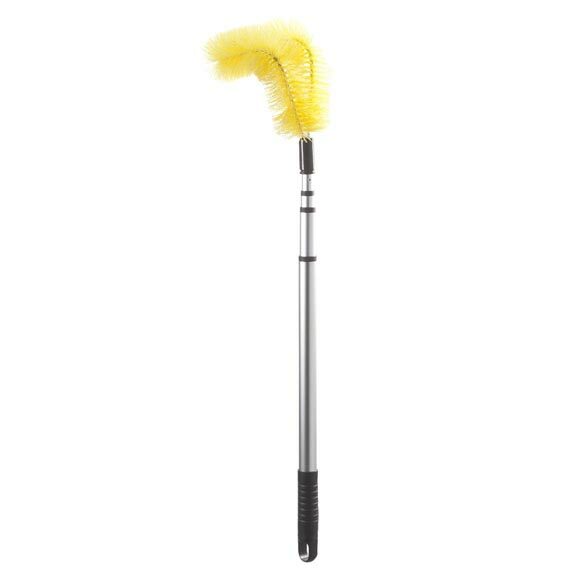 Gutter cleaning brush measures 6 1/2"W x 74"L; collapses to less than 36" for storage. I would but I had to tweek it. I wanted something that would reach the gutters and just slide across top of gutter guards to remove debri off top of them. The problem was the section at the end that the brush screws on to does not tighten so that section swivels. I needed it to be stable, stay in one position, so I just superglued it. I have same situation - leaves sitting on gutters. I need something to brush them off. Be easier cleaning out gutters. So I don’t have to climb ladder. Will get the job done much faster. to clean my gutters safely . can clean onthe ground and not on my ladder. I was looking for a product that will enable me to clean my own gutters without paying someone to do so, and without having to climb a ladder. This looks like the perfect product! I hope it will do the job! To avoid climbing on to the roof of my house. My gutters need cleaning but I can't reach them! I didn't want to climb a ladder. I am a senior customer and my balance isn't that good! 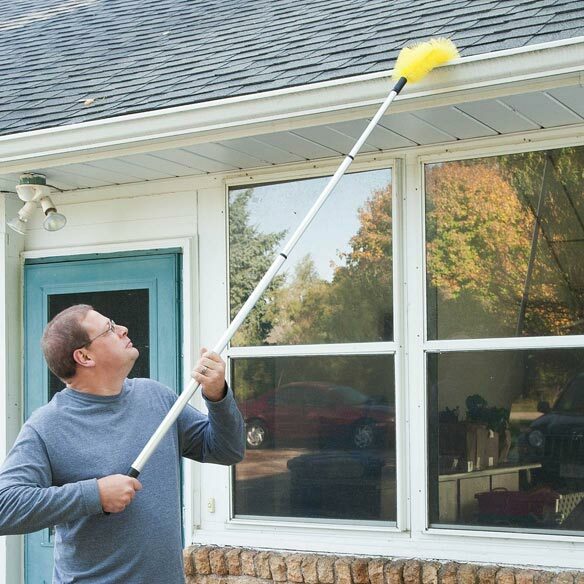 This seemed a practical tool for cleaning gutters and removing spider webs under the eaves. I have a mesh covering over my gutter, but the leaves accumulate on the tops and need to be brushed off. When brush wearout are there refill brushes? BEST ANSWER: Thank you for your question. We do not sell refill brushes for the Gutter Brush. We hope this information will be of help to you. Is the brush a hard bristle that would scratch gutter guards? BEST ANSWER: Thank you for your question. The bristles are made from plastic but do easily bend. They should not scratch the gutters but it depends on how hard you push the bristles while using the brush and also on what your guards are made out of. We hope this information will be of help to you.